It's a shame hardly anyone posts here but those posting entries - says I whilst posting an entry , This challenge has had a very long shelf-life, the mafia portrait especially attracting a ton of interest. It's a great way of getting people to participate and test themselves regardless of experience and I hope it's continued at some point. There are some absolute gems here, Stefano's & Manjaman's in particular this page. I did these a while ago but never got around to sharing them. I really used them as practice for pixel-specific technique; working harmoniously with the grid, finding pleasing shapes, AA. This stuff is second nature to old hands here and there are some some great guides on the forum - thanks Helm but you really have to get your hands dirty. I like those! However, I'm not so sure about the highlights in the middle and bottom two portraits; I think they could do with more work. I have difficulties understanding the anatomy of the middle portrait (the pear-shaped ones). The portrait bottom left is trying to convey stark shading, except it's narrowing the man's face... like a very near frontal light but not quite. I can't put my finger on what bothers me about the shading on the suit, either. As for the bottom right portrait: I'd change the shape of the highlights to convey the form/volume of the shoulder and face. They're all a bit stiff, I wasn't really confident with the medium at the time and I think these are all mouse & 1-px brush , but I learned a lot making them. I added more mid-tone to mr.bottom left and removed the sloppy suit shading, I also tried some changes to his partner in the top row but I really like the Adam Hughes-y vibe I had and I think your edit flattens the face a bit. Test-drove a few things on ms. bottom right but kept the large skin highlights; I was aiming for greasy skin, harsh lighting. I'm not sure how I'd go about improving the sense of form with them. Anatomy aid dead centre . In all seriousness, him & Blondie were intended as cartoon dishevelment. Any pixel technique missteps? they're about as tightly rendered as I could manage. I also tried convey sweaty skin on the cartoon girl. Cartoon doesn't mean inconsistencies, though! Top centre looks great; a lot like that catwoman mugshot, but I wasn't consciously trying to emulate that look. I can't see either of the semi-realistic edits as an improvement per say but a different approach, things like colouring the whites of the eyes and completely removing rendering of the nasal bone doesn't look right to my eye. lovely greasy speculars on Blondie, I'll try toning my highlights down a bit. Cartoon doesn't mean inconsistencies, though! In what way inconsistent? between the girl and him? I think I might make a bunch of individual palettes for these and possibly accessorise a little; some of them look a little bare. Maybe I should jump threads with this. Sorry, meant to get back to you on this sooner, I don't want to come across as being ungrateful for your input because I really am. I'm not sure that I understood what you meant by overshading. I would usually take this to mean excessive bridging between shades like in a bad airbrush job , obviously the softest edge possible here is four decent contrast steps and I haven't attempted dither or similar but you might say that the values on the top girl and partner are too evenly spaced so as to look a bit like a 'posterise' filter.The lighting is definitely highly mannered but attractive I think. What was bothering you about the anatomy of pear-man before I posted the skull? I'm afraid the skull was a bad joke, I didn't attempt to keep the lighting or stylistic choices consistent because I thought the idea of his having realistic anatomy was amusing . Your edit is priceless though, I wish I gone down that route . Bottom lip intended. 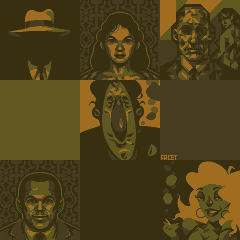 I thought I really ought to do a couple of new portraits in the same restrictions (not Mafia though, apologies to the thread) from scratch since I'm receiving criticism and there's a element of me being a little blind to stuff I've become overly familiar with. I was surprised how much my approach has changed since I did the others. Incremental edits to a couple of the older portraits also. May I suggest you start your own thread? That way this leaves more breathing space for others who want to post here in future.